Have children brainstorm on individual whiteboards or pieces of paper as many ideas and words they can think of that relate to holidays. Children then pair up and together refine their lists, then move into groups of three to refine lists even further. After this the children come back together as a whole class group and make a combined list of vocabulary related holidays. Display words for future reference as a topic vocabulary wall. Show children the picture that is on the front cover of the book. Discuss the people and what is happening in the picture. Once children have concluded that the family is having a holiday, have them make predictions. What plans do you think they have? Do you think they will be away for long? What makes you think that? Draw the students’ attention to the sub-title. Record the predictions under the heading ‘We Predict’. After reading the story come back and discuss predictions. Where they have gone on a holiday (or outing for students who have not been on a holiday). Where they stayed (or what they did for students who have not been on a holiday). Where? How? Who with? Stayed at? Once finished, students pair up and share the lists. Students then introduce their partners to the rest of the class using the information. Make a whole class visual graph showing how many people have traveled on boats, trains, planes by foot or bike etc and stayed at hotels, caravan parks, with relatives etc. Make a whole class e-book using movie making software such as i-Movie or Movie Maker based on the innovation ___Sally_____________ went to __Sydney_____________ with __her cousin and Aunt___in/on a___train_____and stayed in a ___hotel______. The vocabulary list from previous activity could be used. Read the text and then add Grace’s story to the class stories, i.e. Grace went around Australia with her family in a car and stayed in a caravan. Dramatic and visual retelling of a section of the book. Students break into groups of five (mum, dad and the three children). Each group is given a state or territory to prepare a series of freeze frames of the family in that part of the story. Students create a story board with captions either digitally through a platform such as Glogster or similar or on a paper template. Students should be able to successfully demonstrate their understanding of character, story sequencing and setting. After students have completed this activity summarise the findings as a whole class on an interactive Venn diagram. 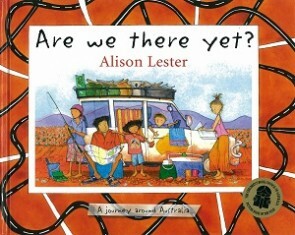 Listen to the clip of Alison Lester talking about the book. Discuss the fact that the book is based on a real event about her family. Make a list of the characters (members of the family). In groups students draw each of the characters and label them using the labelling techniques used throughout the book. As a whole class, groups present their drawings by introducing the character, showing the picture and describing the character. Then have them break into pairs and come up with 3 questions they would ask each of the characters. The class plays a game of Hot Seat with children taking on the characters of the book and class members asking them the prepared questions as well as improvised questions, from the perspective of the character i.e. ‘Grace how did you feel about leaving your animals behind?’. Students develop a compare and contrast (PDF, 162KB) between their families and the family in the book. How is your family same/different to the characters in the book. Who would you rather go on holidays with and why? Students in pairs create a literary sociogram (a visual representation exploring the relationship between each character in the story). Grace will be the central focus of the sociogram and the other characters will be situated around the page, linked to one another via lines with arrows at either end. Students must use elements of the story i.e. sits next to Grace in the car or bought Grace a new hat. They can use pictures, shapes, colours and symbols and can use mind mapping apps such as Inspiration, SimpleMind and Popplet. Through the sociogram students will demonstrate a knowledge and understanding of the roles each character plays in the book and how they connect with each other using examples from the text. the purpose of a recount is to retell an event that has happened in the past. the structure of a recount i.e. orientation, events in order and a concluding statement. the types of recounts i.e. personal, factual and imaginative. Students construct a digital timeline and add photographs that they have collected from the internet and headings demonstrating the structure of a recount. Students engage in an improvised role play of the father or mother from the book driving the car. Students sit in a circle take turns calling out, ‘Are we there yet?’ The student playing the father or mother has to improvise a response in either a statement or exclamation and use voice and intonation to express which one. The class decides whether it is a statement or an exclamation, holding up a full stop or exclamation mark to indicate their choice. Discuss and highlight features of a proper noun. Provide students with a definition such as, a proper noun is the name of a specific person, place or thing and must always begin with a capital letter. Brainstorm a list of proper nouns. On photocopied pages of the text have children working in pairs, use highlighters to indicate proper nouns. Different colours could be used for different types of nouns i.e. place names, people names, animal names etc. On a giant map of Australia plot the names of the places that the family traveled to. Groups of students could decorate the capital at the beginning of place and then the remainder of the word could be printed, thus highlighting the capital. Students bring in a souvenir from a holiday they have been on or a place they have visited. The souvenir is placed in a mystery box/bag. The student must give and oral recount of their holiday ending with … ‘and when I was there I got this special souvenir’. The rest of the class must play 20 questions and try to guess what the souvenir is. The person who gets it correct is the next person to present their oral recount and souvenir. Students should successfully be able to demonstrate their knowledge of the feature and structure of a recount as well as a question. Display a map of Australia marking the places the family visited. Each group of 4 selects a city or town. Then they research and compile information through a variety of sources i.e. internet, information books, brochures (teachers should source these from information centres before commencing the unit) to complete a graphic organiser (PDF, 177KB) with five main headings PLACE, LOCATION, POPULATION, CLIMATE and MAIN ATTRACTIONS based on the destination in the book. Information should be in dot points and include as much information as possible. Students can collect this information together in their groups or in a jigsaw format where a section is allocated to each person in the group, (that is, one person researches climate, one researches population etc) and then come back together as a group to report and share their knowledge. Students present their research to the class trying to convince the group of reasons why this place would make a great holiday destination. Based on the presentations students then create their own wishlist of top three destinations with three reasons why they want to go there. Collate the information on the top destinations and display an information graph. Individual groups peer assess using the peer assessment template (PDF, 101KB) based on how persuasive they were. Show class some examples of persuasive texts. Discuss the literary features such as emotive language, exaggeration, present tense, rhetorical questions etc used in these types of texts. Have children come up with a class list. Students create a tourist pamphlet/brochure using Microsoft Publisher or similar to persuade people to come to the place that they have been researching. Students now select their own destination from the map. Students create an online postcard to try to convince the recipient that the place they are writing from is worth visiting. Shows elements of persuasive devices explored throughout the lesson, convincing the reader they need to visit the place also. YouTube clip created to accompany Are We There Yet? Duration Four weeks with 3-4 lessons per week. NICOLE HUGHES has been teaching for close to 20 years in both NSW and ACT schools. She is currently completing a Masters of Educational Leadership and works as an Executive Literacy Officer for the ACT Education and Training Directorate. Within this role she works in the U Can Read Program helping families who have struggling readers. She has an insatiable appetite for books (especially children’s books) and looks forward to continuing to share her passion with students and families ‘hooking’ them into books and the joy of reading.